Dr. Lekha Chakraborty, faculty at NIPFP was one of the panelists in the FICCI-Government of India Workshop on "Mineral Concession Rules 2016", held at Federation House, Tansen Marg, New Delhi, June 1st 2016. workshop, and spoke on "Mining Taxation Regime: India and International experiences" . The Special Address was delivered by Secretary, Department of Mines. The Senior Officer, Minerals Division, Niti Ayog; Controller General, IBM; Vice President, SBI Capitals Ltd; Managing Director, Essel Mining and Industries Ltd, Chairman, Jindal Steel and Power Ltd. were the other distinguished panelists. FICCI and Government of India has organized this workshop against the backdrop of the enactment of Amended Mines and Minerals (Development & Regulation) Act 2015 and the Mineral Concession Rules 2016. 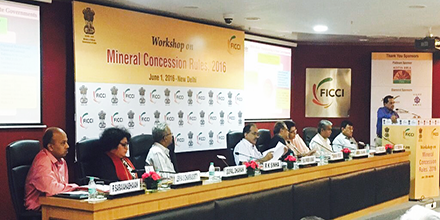 This Workshop on Mineral Concession Rules 2016 on June 1, 2016 was held at Federation House, Tansen Marg, New Delhi. Along with the mining organizations, the officials from Ministry of Environment, Forest & Climate Change, NITI Aayog and other stakeholders were the delegates of the workshop. The key objective of the workshop was to identify the future of Indian mining industry in the gambit of Mineral Concession Rules 2016 and analyse how the rules are to be implemented. It also identified the probable challenges and their remedies, focusing upon the mineral development in the country.